Origin and Habitat: Known only from the coastal rivers of central Vietnam. Found in shallow and still parts of rivers and streams thick with aquatic vegetation, mud or sand substrate, and usually floating plants providing shade. Compatibility/Temperament: Peaceful. Must be kept in a small group, preferably of at least 5 or 6 to avoid stress. Suited to a SE Asian aquascape with rasbora (Boraras, Trigonostigma, etc. species), small gourami (Trichopsis, Parosphromenus, Parasphaerichthys sp). The writer (Byron) has very successfully maintained this species in the same aquarium with a group of Yasuhikotakia sidthimunki (Dwarf Loach); the loaches inter-relate within their respective species and display no antagonistic behaviour and never interact cross-species. Omnivore. Prepared foods including sinking pellets, disks and tablets, frozen and/or live daphnia, cyclops, artemia (brine shrimp), and small worms such as blackworms and bloodworms as treats. Attains close to 2 inches. No less than 30 inches in length, such as a long 20g and up. Soft to moderately hard (< 12 dGH), acidic (pH 6-7), temperature 25-28C/77-82F. A playful small loach well suited to the smaller community aquarium. The aquarium should contain several chunks of wood containing tunnels and crevices (the Malaysian Driftwood is ideal) with some open area in front for feeding, a substrate of smooth sand or very fine gravel, and floating plants to shade most of the light or this fish may be uneasy [see comments above on the habitat]. Low light requiring plants are best in this subdued atmosphere, and Java Fern and several crypts are well suited, though with sufficient chunks of wood, substrate-type plants are not needed. 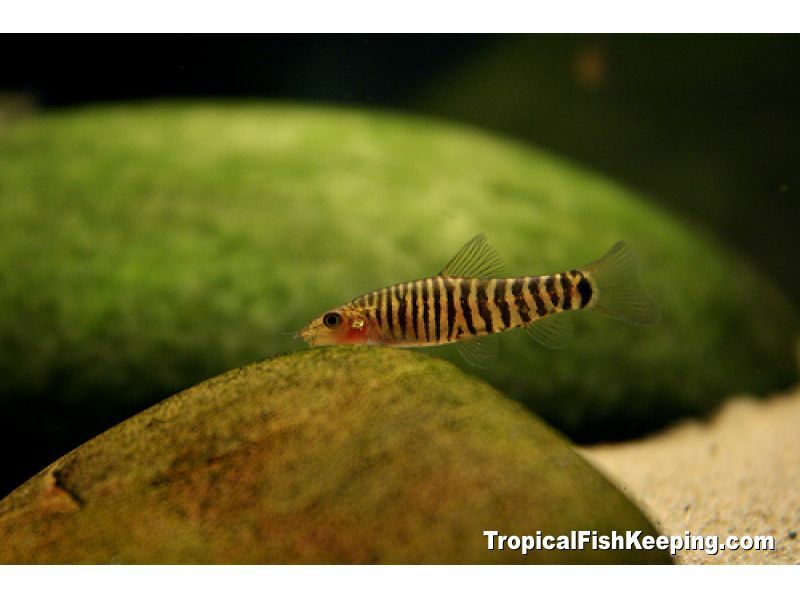 Like most loaches, it is highly social and must be kept in a group, preferably of five or more. This fish will swim mid-water as well as along the substrate, browsing surfaces for food. It must have several chunks of bogwood preferably having tunnels; the fish enjoy chasing each other as if in a game of tag through these tunnels. This species was described in 1944 by H. Rendahl as Nemacheilus cruciatus; later that same year, Rendahl erected the genus Micronemacheilus for this one species. The name Nemacheilus derives from the Greek nema [= filament] and cheilos [= lip], a reference to the furrowed lip, and Micronemacheilus (Greek micro = small) means "small filament lip." The species epithet cruciatus derives from the Latin for torment or torture. Frehyof and Serov (2001) transferred this species to the genus Yunnanilus which originally had been a subgenus of Nemacheilus. The name Yunnanilus is derived from the SW China city of Yunnan. This placement resulted in this species being the only one of the 30 species in the genus that has vertical stripes, 8 branched dorsal fin rays, and a pair of large papillae in the middle of the upper lip. The genus was in the Menacheiliinae subfamily of Balitoridae, a family of hillstream or river loaches that holds more than 700 species in 60 genera within two subfamilies, the Balitorinae and the Nemacheilinae. Some ichthyologists believed the subfamilies were not monophyletic, and proposed that Nemacheilinae should be raised to the status of a distinct family, Nemacheilidae. 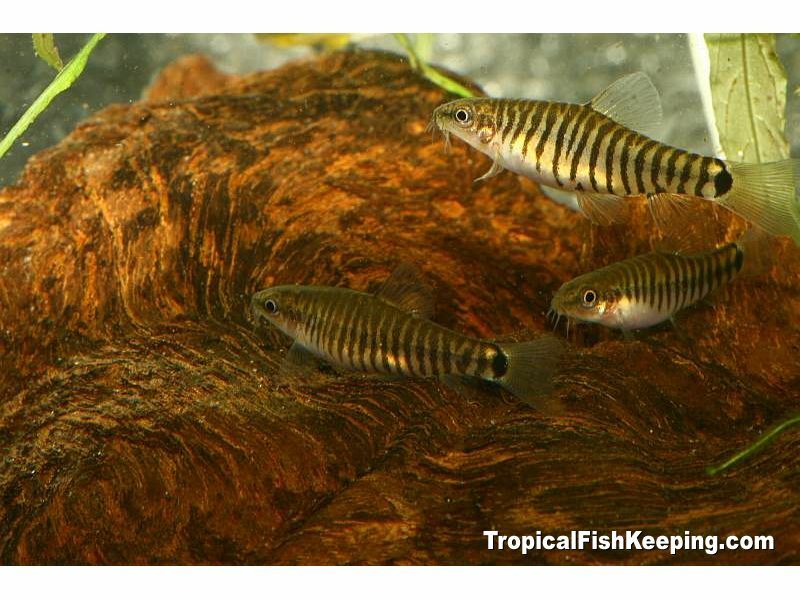 This was the largest and most complex group in the superfamily Cobitoidea, the true loaches. Dr. Maurice Kottelat began work on a comprehensive review of the loaches in 1980, and after more than 30 years the review was published on December 28, 2012. The subject species is returned to the genus Micronemacheilus as the lone (to date) species (and thus the type species for this genus) due to its very distinctive physiology. The subfamily is raised to family status. Freyhof, J. and D.V. Serov (2001), "Nemacheiline loaches from Central Vietnam with descriptions of a new genus and 14 new species (Cypriniformes: Balitoridae)," Ichthyological Exploration of Freshwaters, 12 (2), pp. 133-191. Kottelat, Maurice (2012), "Conspectus cobitidum: an inventory of the loaches of the world (Teleostei: Cypriniformes: Cobitoidei)," Raffles Bulletin of Zoology Supplement 26, pp. 1-199. Last edited by Byron; 06-17-2013 at 07:43 PM.